BETHLEHEM (Ma’an) — Shin Bet, Israel’s internal security agency, detained Iranian-American writer, Reza Aslan, as he was entering Israel through Jordan, with his family. 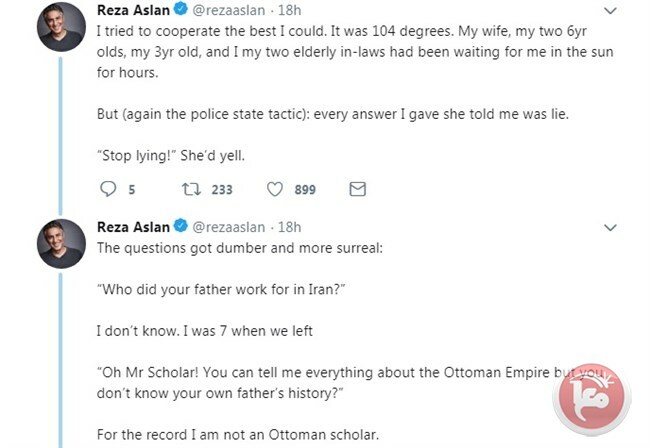 Reza Aslan, 46, took to his Twitter account, where he said that the Shin Bet used police state tactics against him and his family. Aslan arrived in Israel with his wife, children, and in-laws after a visit to Jordan. Upon his arrival, he was separated from his family at the border and detained by the Shin Bet, which repeatedly threatened him . According to Aslan, he tried to cooperate as best as he could, but was accused of lying after answering each question. The Shin Bet interrogator warned Aslan not to enter the Palestinian territories, not to meet with or speak to any Palestinians or any Israeli troublemakers and warned him by saying that “we are watching you,” Aslan wrote. 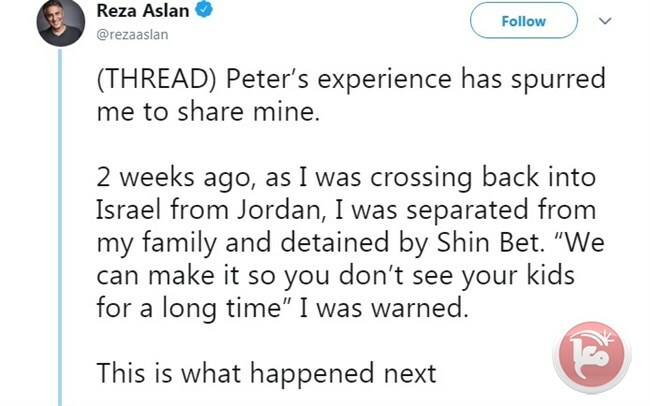 Aslan’s tweets were triggered when American-Jewish journalist and commentator, Peter Beinart, 47, was also detained by the Israeli Shin Bet at Ben Gurion Israeli airport and interrogated about his political views and involvement in political activities that threaten democracy or promote violence. Beinart, who considers himself a supporter of Israel, has publicly criticized the Israeli government’s policies toward the Palestinian people and its close alliance with United States President Donald Trump. The Shin Bet later apologized for causing any distress saying that it was investigating the incident. This statement contradicts the newly approved controversial Nationality Law, that Netanyahu showed full support for, in which the law enshrines the status of the State of Israel as the nation state of the Jewish people. Hence, non-Jewish citizens of Israel are already classified as “second class” citizens.